In the late 80s a NASA scientist experimenting with the electrode extraction of hydrogen from water found that he could neutralize the acidic oxygen residue with sea salt. To his surprise he found that he had inadvertently stumbled across a completely natural technique to stabilize oxygen. His discovery, Di-atomic oxygen, could deliver 30 times more oxygen than tap water. NASA never commercially developed this although it was widely used in the space program. In recent years Reach for Life Intl. P/L has improved upon the process and the result is a potent oxygen supplement. Aids in achieving elevated oxygen saturation in the blood and cellular level. Effective against pathogens in the body. 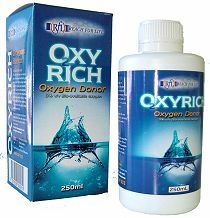 Who may find benefit from taking Oxyrich?